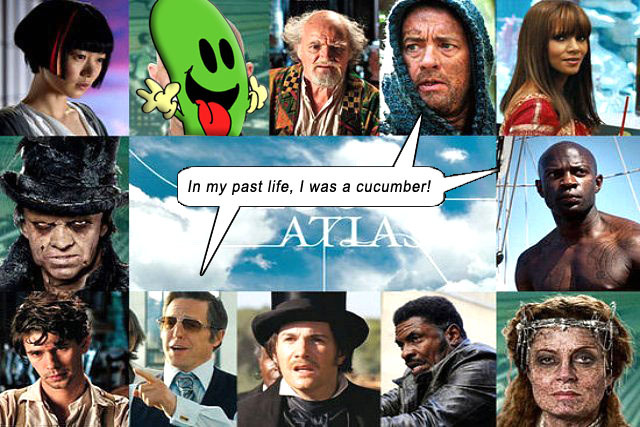 CLOUD ATLAS is six incredibly evocative movies mashed together to make one incredibly annoying one. It’s bolder than most movies, bigger than most, intelligent and well-produced, with epic sweep across past, present and future societies, with grandiose performances, seamless effects and what seems like a million hanging threads – until we realize CLOUD ATLAS is only espousing one thread: reincarnation. If this doesn’t make any sense – keep reading. And it still won’t make sense. Movie Maniacs, be prepared to not know what the fookin hell is goin on in the first half hour of this giant film. You will see Tom Hanks onboard a slave ship slowly poisoning Jim Sturgess, Halle Berry as an investigative reporter digging into a company run by Hugh Grant (in an excellent conniving role as a dirty CEO), Jim Broadbent being threatened by British thug Tom Hanks, Halle Berry as an offworlder infiltrating Hanks’s tribe, Hugh Grant as a face-painted cannibal killing Jim Sturgess, brilliant young Brit Ben Whishaw (SKYFALL) as amanuensis (tabulator) to Jim Broadbent’s cantankerous composer, Doona Bae as a pseudo-clone in servitude rescued by Jim Sturgess in heavy Asian makeup, and on it goes… featuring (also playing many characters) Susan Sarandon, David Gyasi, Keith David and Hugo Weaving (we can never mistake his Agent Smith hiss no matter the poundage of makeup he tries to hide under). Each of the story threads is uniquely excellent, with edgy concepts (cannibals, clones, gay composers) and invigorating dialogue (although Hanks’s hybrid vernacular in the post-apocalyptic vignette – resembling the kids’ speech in MAD MAX BEYOND THUNDERDOME – was annoying, for being too esoteric and unclear), but trying to shotgun all of these stories at us with editing that would make an MTV director’s head spin, sullies the execution. It spells the ruination of all of them. And the fact that all the characters play various sexes and races, and are usually caked with heavy prosthetics, is also distracting. We find ourselves at first sighting trying to figure who is behind the putty-face, instead of paying attention when it is needed most. And who gave the go-ahead for the Caucasian actors to fake Chinese eyes? Is that just plain dumb or just plain racist? Directed by Tom Tykwer, Andy Wachowski and Lana Wachowski (from the novel by David Mitchell), CLOUD ATLAS is a script continuity supervisor’s worst nightmare. Of course, all the tales interconnect, but in the most tenuous way possible. Many times, it is simply a case of someone living along the same timeline as someone that lived previously. For example, Hanks keeps running into Halle in the most inauspicious ways, always finding a little lust in his heart for the total stranger with the pearbottom pants. Hanks also has many run-ins with Jim Sturgess’s many characters. (Hanks seems to be having the most fun with the multiple roles, most of his characters extemporizations on his saucy Professor Dorr from THE LADYKILLERS 2004 – buck-toothed, balding and sinister.) Jim Broadbent would yell jokingly to folks at a retirement home, “Soylent green is made of people!” – and in Doona Bae’s ascetic future that classic Charlton line attains a horrifying, meaty reality. But the concept of continuance is easily grasped, and more sensible, if we approach it like Carl Sagan. The DNA in you has been circulating in the human animal since humans were animals. Continuance. Right there in front of us. And when we die, all the base elements that we are composed of are literally absorbed back into the Earth (or into the atmosphere if we are cremated), to be used in other organisms birthing, eating, shitting and screwing. You may not “return” in human form, and you may not “return” in a human at all. But you return. Make no mistake. The elements have nowhere else to go except to circulate on the planet. Quod erat demonstrandum. It ain’t supernatural. And if you haven’t got a clue what I’m talking about – wait till you see the movie. Directors: Tom Tykwer, Andy Wachowski, Lana Wachowski. Writers: Tom Tykwer, Andy Wachowski, Lana Wachowski, David Mitchell. Starring: Tom Hanks, Halle Berry, Jim Broadbent, Hugo Weaving, Jim Sturgess, Doona Bae, Ben Whishaw, Keith David, James D’Arcy, Xun Zhou, David Gyasi, Susan Sarandon, Hugh Grant.